This is Edward James Miller, my father’s father. I’m remembering him this memorial day, not because I’m sad… but rather because I’m happy. For 6 decades my father had loads of questions and some deep emotions about his real father. Many of those questions about have been answered. He now has a whole new side of his family, who have wondered about him all those years. I am looking to compile stories, letters and mementos into some sort of visual or written record of the whole amazing story. The quick version of this is that he married my grandmother, Mary Marjorie Hunt, on September 28th. He was home on leave after having been overseas for 9 months. He then headed back overseas and was shot down over Chareloi, Belgium while returning from Mission 287 to Ludwigshafen Germany. 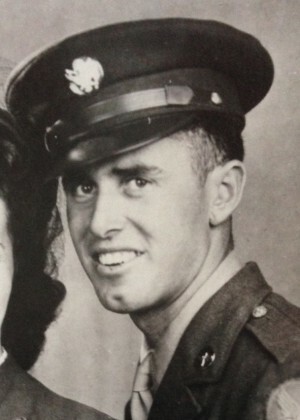 He was listed as missing on April 1st 1944.My grandmother was pregnant with my father. He was formally declared deceased on October 14th, 1945. 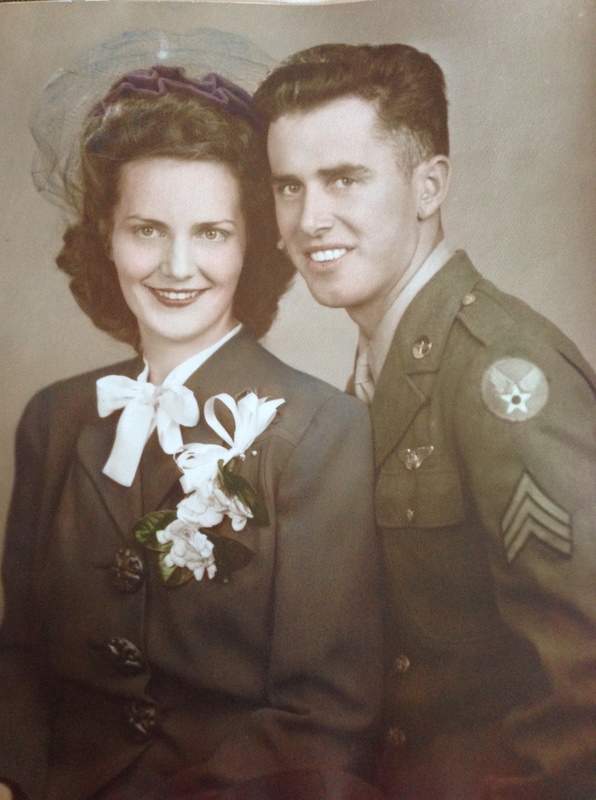 Mary Marjorie Hunt & Edward James Miller – Their Wedding Photo September 28, 1943 . They are both 20 years old. Edward never met his son… Edward James. My grandmother changed my father’s name to James Edward (a question I’d like to have answered) and I am named James as well. My grandmother remarried a few years later and out of respect for her new husband, Charles Simon, did not talk much about her deceased husband. Together they were the ultimate grandparents. Shortly before she passed, a few years ago, I was able to gather the exact details about Edward’s last mission that she never knew. 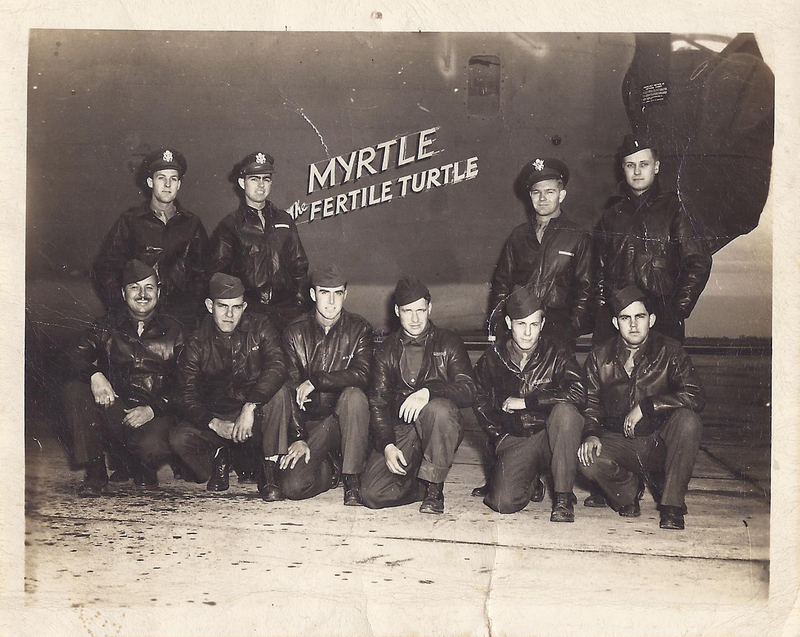 The Brave Men of Myrtles Fertile Turtle and later of the Judith Lynn. Grandpa is 3rd from the left, kneeling. I think about those who serve in the military a lot and am proud to say I am a part of the Wounded Warriors Project. These men are the heroes, truly. Let’s remember all of those who gave any small part of their lives so we can enjoy the life we have. So…I have had this very picture in my living room for years. My great uncle was 1LT Joseph Roznos. I found this picture online. I have other photos of the crew….shoot me an email and I will send you copies…I’ll look through them for your grandfather. Wow. Amazing. Thank you so much. I also have that photo. My uncle was the co-pilot, 2nd Lt. T.C. Johnson Jr. I would very much appreciate seeing any other crew photos you have. That is the only photo I have. Did you get the link to the video with Kenneth Jordan? Nicolas. Thank you for your comment. The only photos I have are the ones posted here.